Happy finals season, Violets! The end of semester can only mean two things: summer is so close we can taste it, and final exams are finally upon us. Unfortunately, exam season is always accompanied by an influx of students in Bobst who steal your favorite desk on the eighth floor that overlooks WSP and the Empire State Building. Fear not! if you’re looking to migrate out of the library to some unexplored territory, you can try out these great cafes near campus. Famous for a scene in “The Godfather Part II” and for bringing the cappuccino to America, this historic cafe is one of the oldest in Greenwich Village. 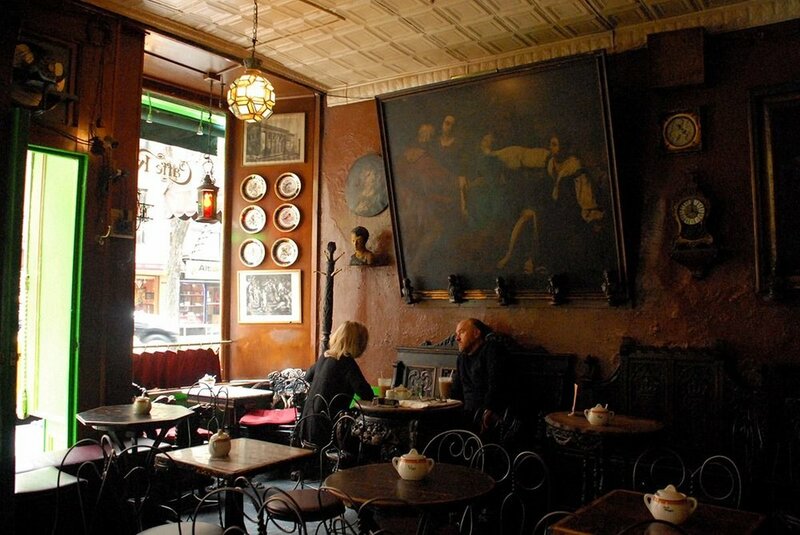 Caffe Reggio is on MacDougal Street, just around the corner from Kimmel and a block from Washington Square Park. If you’re looking for an eclectic study atmosphere with a touch of Village charm, check out this neighborhood favorite. The original espresso machine from 1902 is still located on the back wall, and you can even sit on a bench which once belonged to the Medici family. How much more inspiring can your study space get? I discovered this one a few weeks ago with my cousin and low-key fell in love. If you like a modern and hip vibe, check out this cafe. White brick, a statement turquoise wall and a neon sign that says “COZY AS FCK” make this place perfect for a latte and study ‘gram while you go through your notes. As a bonus, it’s right in SoHo, so when you’re ready for a study break, you can indulge in some retail therapy to ease the pain. A dog cafe has finally opened in New York City, and it’s only a few blocks from Union Square. Yes, you can play with puppies in between your last minute reading and snacking on something from their all-vegetarian menu. I cannot think of a better way to relieve finals stress than petting a dog, so definitely check this out if you’re missing a pooch! This tiny gem has two locations: one on Sullivan Street less than a block from Washington Square Park and one on Second Avenue in the heart of the East Village. The coffee is to-die-for, and the atmosphere is the perfect blend of rustic and modern. It’s pretty small though, and the East Village location does not offer Internet, so get there early and bring some work you can do without a laptop! Stumptown Coffee Roasters is well known among coffee connoisseurs, but their little cafe just a block away from the WSP on Eighth Street and Macdougal might not be. This place is very hipster-chic. An all-wood interior, baristas in suspenders and exposed brick give this cafe a cozy feel, but the huge windows make sure you can still see the sun. It’s the perfect spot if you’re trying to do some last minute cramming close to campus, and the coffee is amazing. Every NYU student has a favorite study spot, whether it be Bobst, Starbucks on the Square or the Bean, but finals season means that your tried-and-true locations might be filled with more students than usual. Branch out and try any of the amazing cafes on this list for somewhere new –– you might fall in love! Plan the Perfect Road Trip This Summer!